Australia is a huge country and has different climate zones. First of all, don’t forget Australia is on the Southern Hemisphere, which means that summer and winter is opposite from the Northern Hemisphere. The Australian ‘Alps’ and the Tasmanian mountains have a mountain climate and the highest peaks are usually covered by snow all year-round. Here you have the outback that exists of desert and bush. In summer temperatures can reach up to 50 degrees Celsius and sometimes there is no rain for months/years. This territory has a continental climate. Relatively mild and wet in summer and cold winters. The state has a temperate, humid subtropical and oceanic climate. In the South East cool to cold weather all year round and snow in winter. 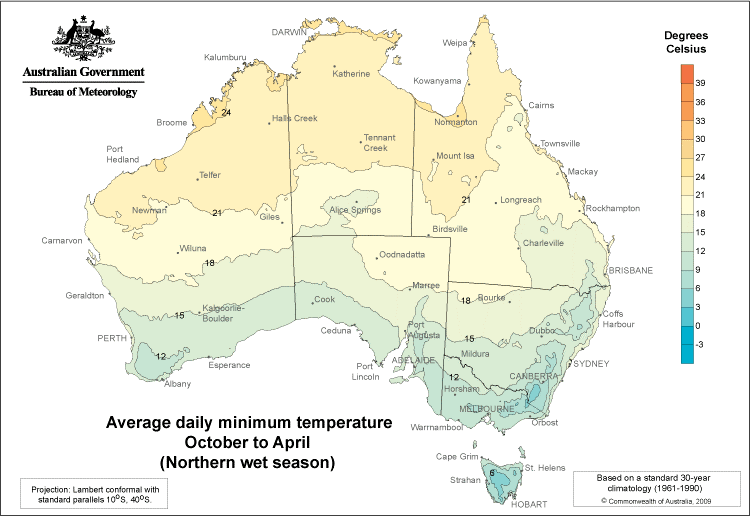 In the southern half of NSW generally warm to hot in summer and cool in winter. North West NSW very hot summers and cooler and drier winters. Bordering to QLD hot and humid summers and mild winters with sunshine. The coldest region is the Snowy Mountains. The territory has two climate zones. In the Northern part (including Darwin) - a tropical savannah climate (high humidity and wet season (Nov-Apr) and dry season (May-Oct). In dry season it is warm and sunny nearly every day. In wet season there can be tropical cyclones and monsoon rains. The Central region is arid/semi-arid, with very hot summers and relatively cool winters. Due to the size of the state there are different climate zones in the state. Most of the state has an arid/semi-arid climate. The couther coastal parts have a Mediterranean climate (mild wet winters and hot dry summers). This state has a climate with four seasons. In Victoria there is a semi-arid, hot (North West) and mild climate (along the coast). The south west corner of WA has a Mediterranean climate and the rest a hot arid/semi-arid climate. The Kimberley has an extremely hot climate (monsoon) and a very long dry season.